The film is in Russian with Turkish subtitles. 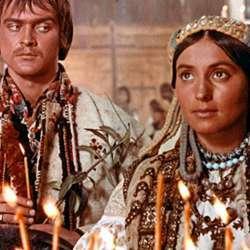 Parajanov stunned world audiences in Protected content his Shadows of Forgotten Ancestors, popularly known as the Romeo and Juliet of the Carpathians. The film is set among the Hutsul people of the Western Ukraine, an isolated ethnic group who live in the upper reaches of the mountain range. Their lives take place within a harsh environment and an ornate cultural system little changed since the 18th century. The film was Parajanov's first major work and earned him international acclaim for its rich use of costume and color. It based on the classic book by Ukrainian writer Mykhailo Kotsiubynsky.